It's that time of year again, where everyone realises that they love Autumn the best. 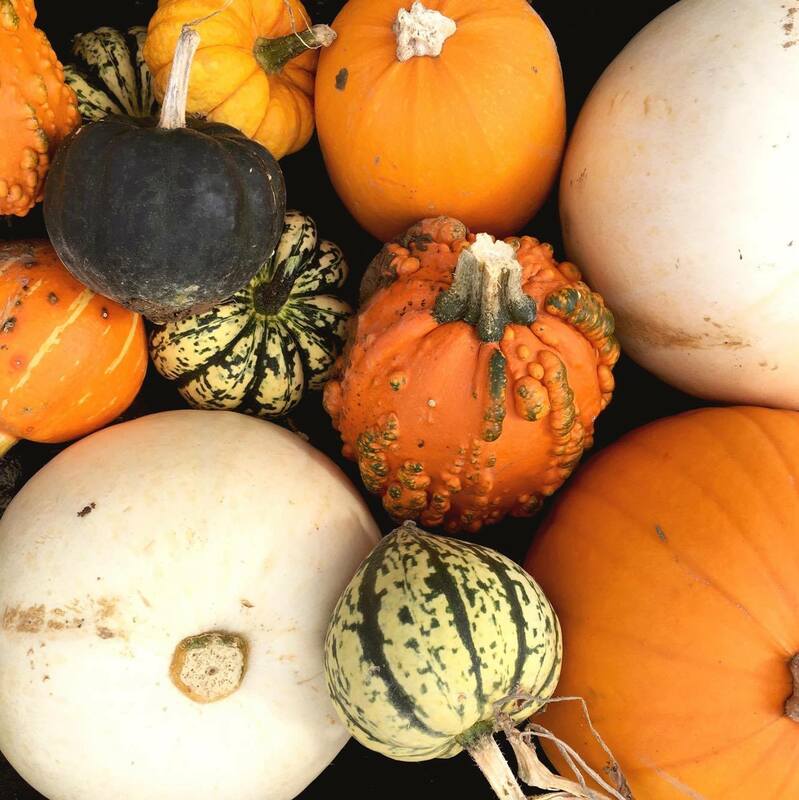 Because jewelled coloured leaves, fallen acorns and conkers and a sea of orange pumpkins truly make people happy. Taking a quiet stroll through crunchy leaves, splashing in muddy puddles, collecting pinecones for crafts and enjoying the warm low sun on our cheeks truly make a hectic life a calm one. 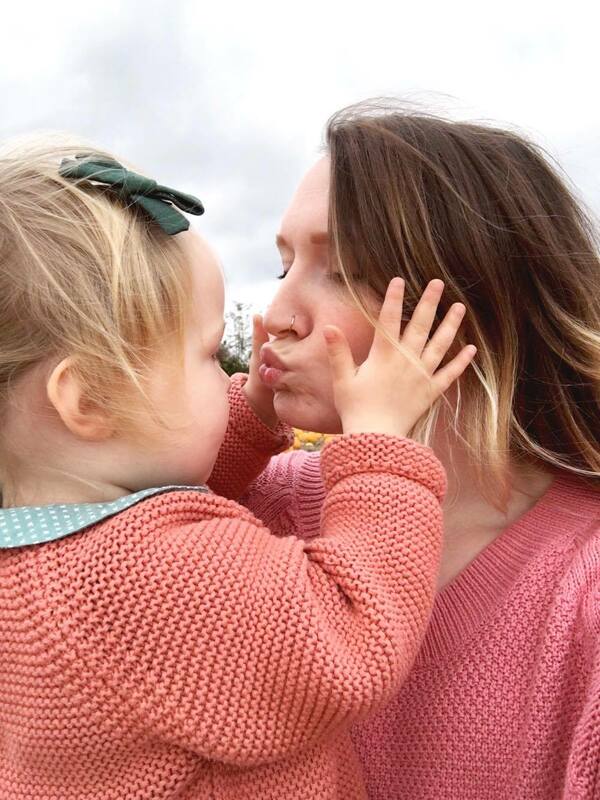 A few weeks ago, Jenny came to stay and we took our Autumn adventure loving selves to the Pumpkin patch, 10 minutes down the road. I mentioned last year that I'm not much of a Hallowe'en type of girl (because Christmas is my calling) but I wanted to acknowledge it this year. 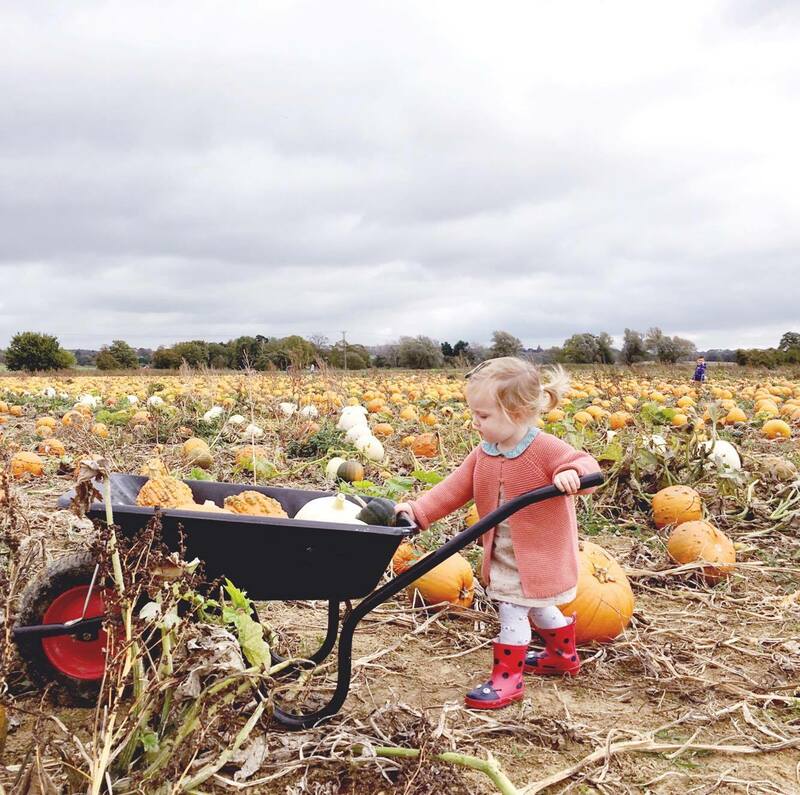 My first task is to collect the pumpkins, with my very special helper of course. 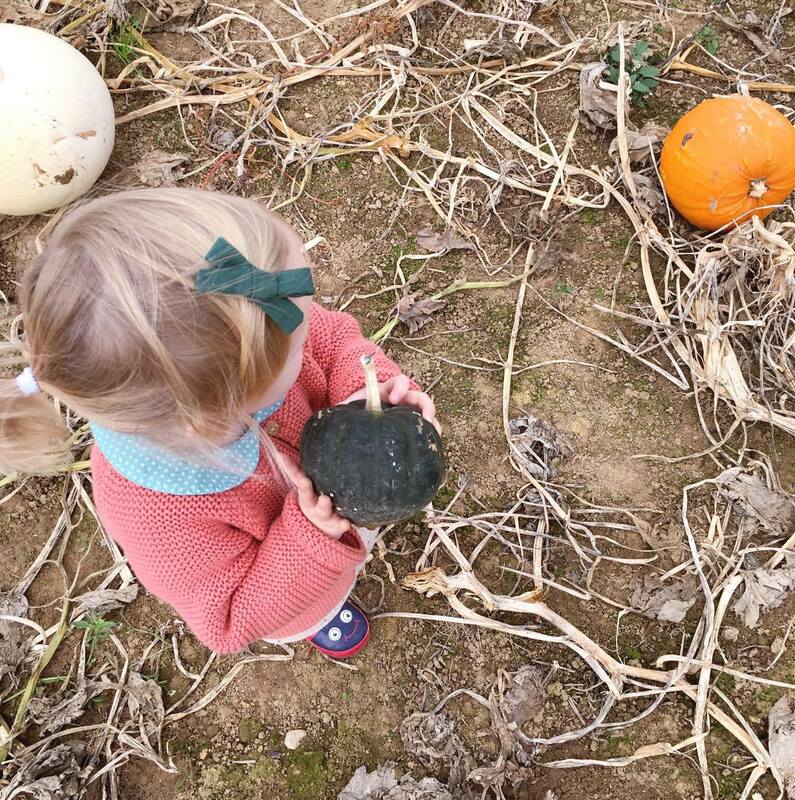 Olive absolutely loved exploring the field of squash. She was mesmerised by all the different shapes and sizes, pointing to each one she found (literally each one!). 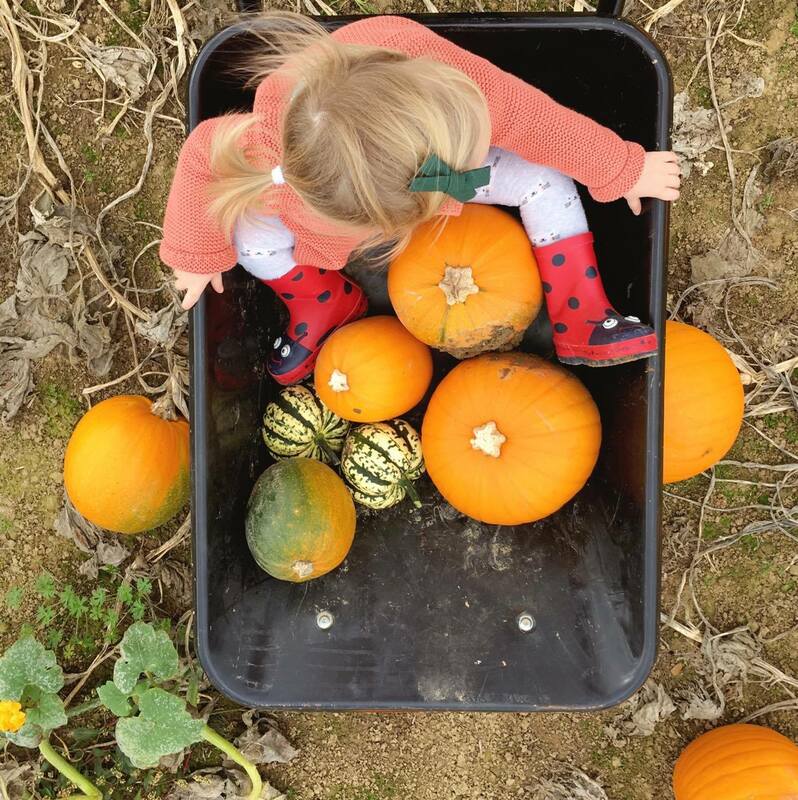 She collected little green stripey ones, a dark green one and even a teeny tiny orange one and helped load the wheelbarrow. Stopping every 10 or so minutes asking to sit in it (which makes for the perfect snap!). I was searching for the perfect orange one. A smooth, perfectly round one (not too big, not too small, but juuuust right. ), this one was for carving. I chose a big white one too, there seemed to be lots of those this year. A perfect Cinderella carriage if ever I saw one! We spent a good hour and a half, maybe two hours there at the farm. Olive was just having way too much fun so I just let her wander. After a rather full wheelbarrow (and achy arms! 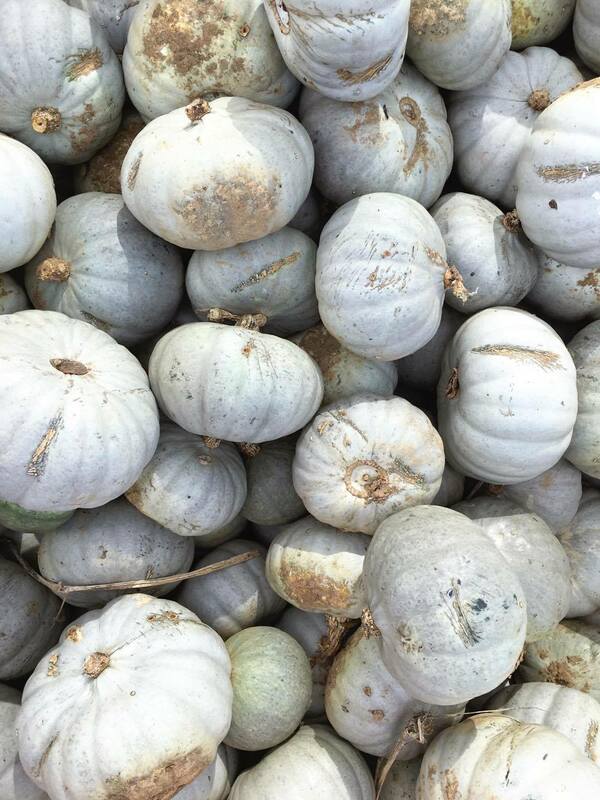 ), I emptied the excess of stripey squash Olive collected and went away with six pumpkins. A big white one, two oranges, an extremely warty looking one, a small green stripey one and a ghost (grey) pumpkin. All for a round £10. It was a good haul. We loaded the boot with all our treasure and popped back to the entrance for popcorn lattes and doughnuts. 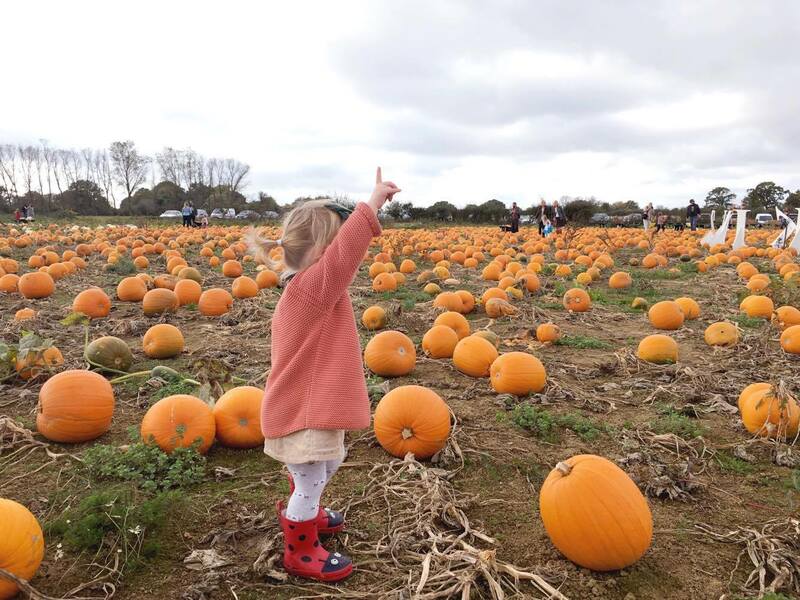 We sat on hay bales and let the sunshine warm our noses, watching the excited little children choose their perfect pumpkins. And observing Olive roll around in the hay. We all had such a wonderful time, and the weather was glorious, we couldn't be luckier! ^^^ This one too - She's a talented lady! 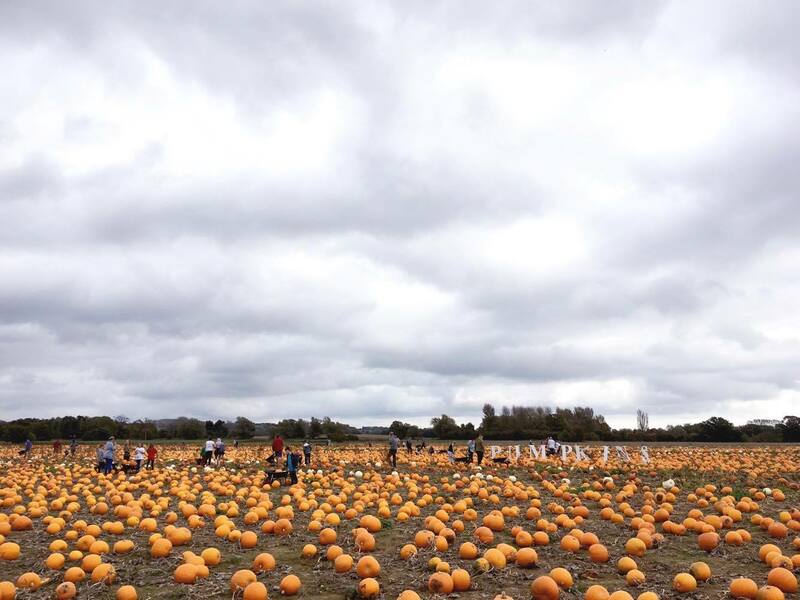 This weekend, Sebastian is going to carve our orange ones, whilst Olive and I help scoop out the middle. I can imagine she will enjoy scooping out the seeds as much as she did helping to choose them. That's the exciting thing about Toddlerhood, everything is wonderful, every new thing is fascinating. And being able to help is so important to her. 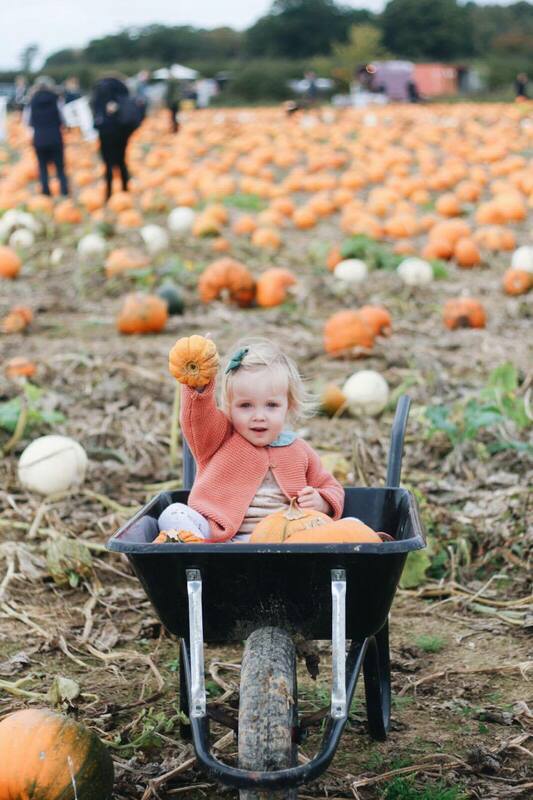 If you fancy a peek of last year's pumpkin picking post (& reminscing with me of how tiny Olive was! ), have a read here. 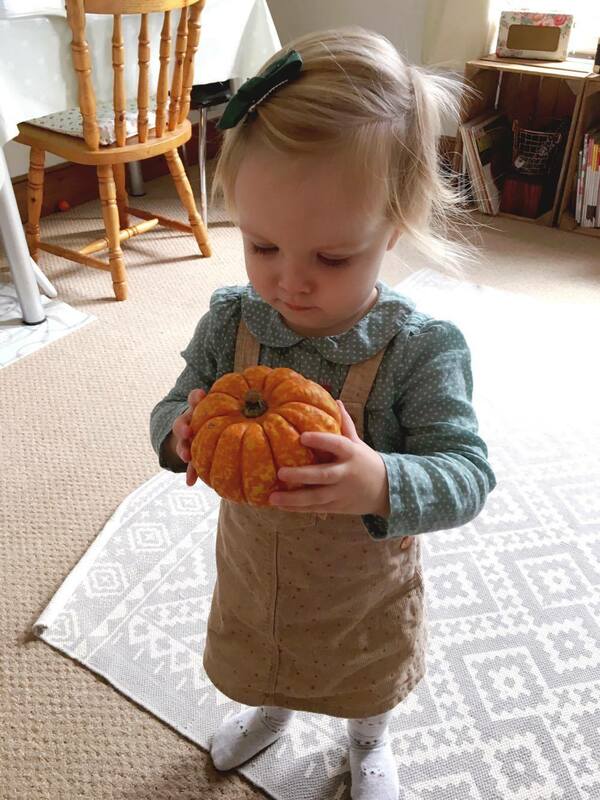 Olive and I have also been drawing/colouring in pumpkins, making bat garlands and eating Witches' finger shaped biscuits. As well as making bat costumes for her to glide around in. What Hallowe'en traditions have you been up to this year/what do you have planned? Such gorgeous photos! 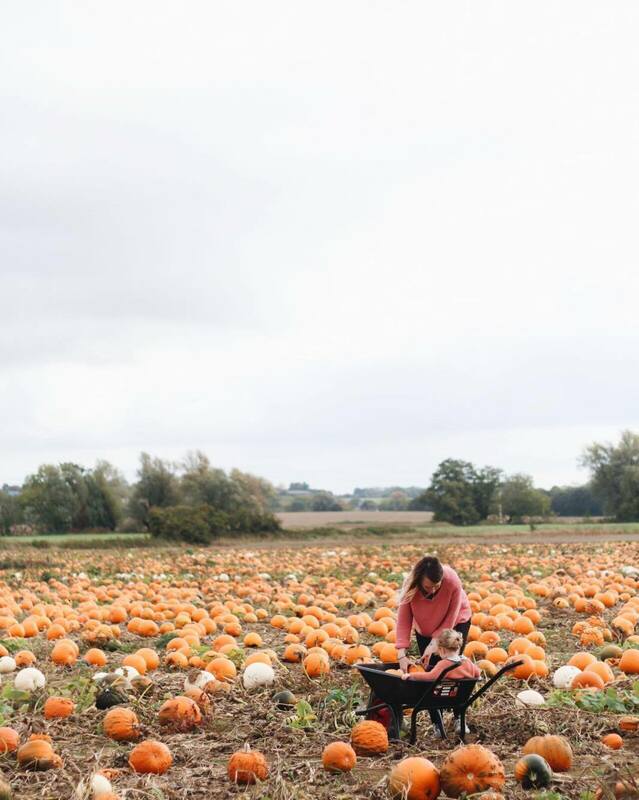 I visited a pumpkin patch last week and it just made me feel so autumnal! I'm very much a Hallowe'en girl but I do love Christmas as well! 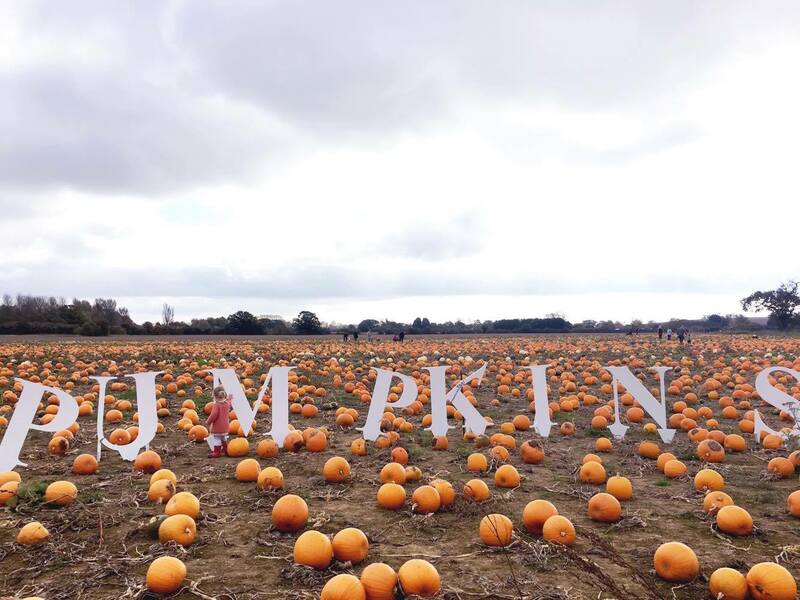 I went pumpkin picking for the first time this year and absolutely loved it! Your photographs are so lovely and really capture what it is all about. Looks like you all had great fun. I am going to carve my pumpkin tonight ready to put on the wall outside our house tomorrow and I have also sent out some halloween cards.